Habe aus UK einen offenen Güterwagen erhalten - gemarkt mit 'Made in Great Britain'. Kennt jemand den Hersteller? Die Machart entspricht der einer Kaufhausbahn. Die Achshalter sind aus einem Stück mit am Wagenkasten und durch die Bodenplatte gesteckt. Könnte das Brimtoy sein? Die kleinen Puffer und die schwarze Kunststoffbodenplatte sehen danach aus - obwohl mir nur vierachsige Waggons von Brimtoy bekannt sind. 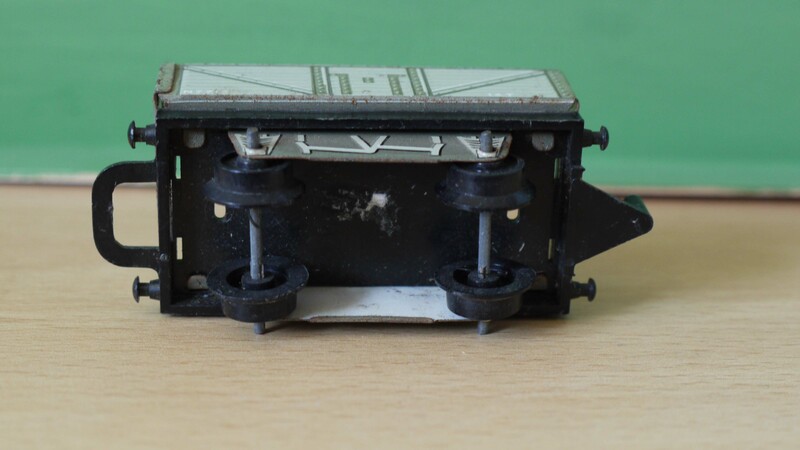 I thought I had one similar somewhere in my train boxes, and I've managed to find it. It is the same as yours with a slight variation. 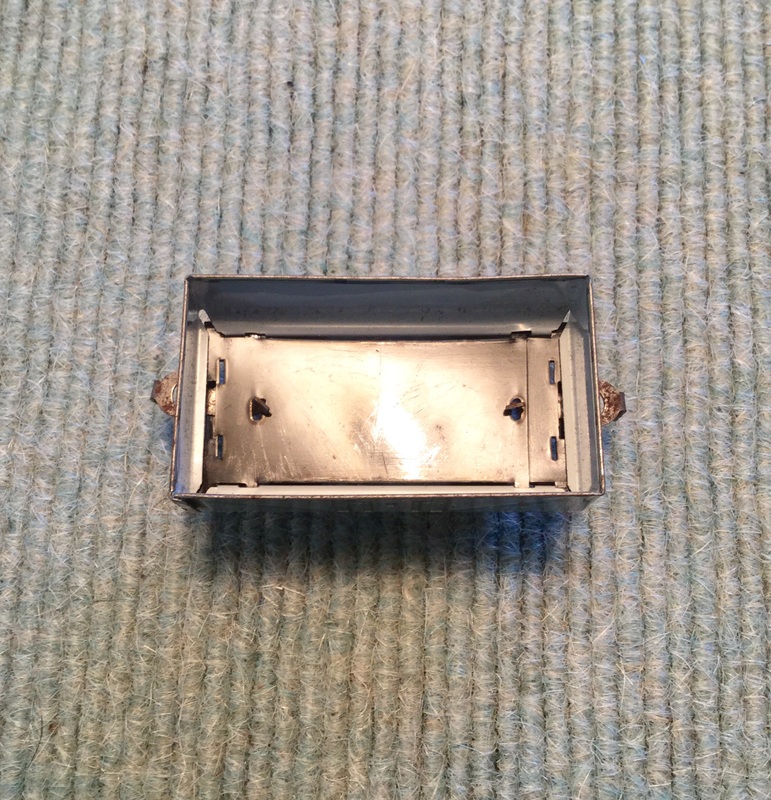 Maybe yours was altered to fit the tinplate connecting hooks. I didn't know who the manufacturer was, but I showed it to my friend Jeff Carpenter, who said that it was probably Brimtoy. I've looked around many web sites but never seen anything like it, until yours. because they have the same holes pressed in. 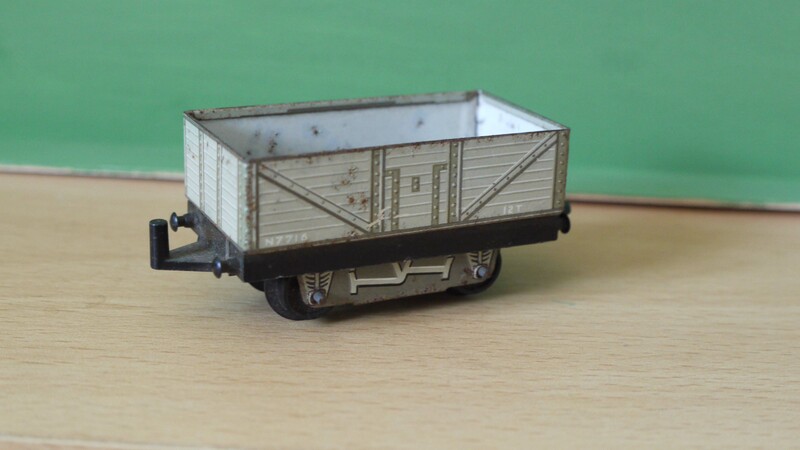 This is an interesting tinplate truck showing the typical english truck brakes. awesome! Thanks for your reply. Despite the coupling it is pretty much the same. I guess my car with the metal hooks is an earlier version. So I wasn't that wrong to bring in Brimtoy as manufacturer. 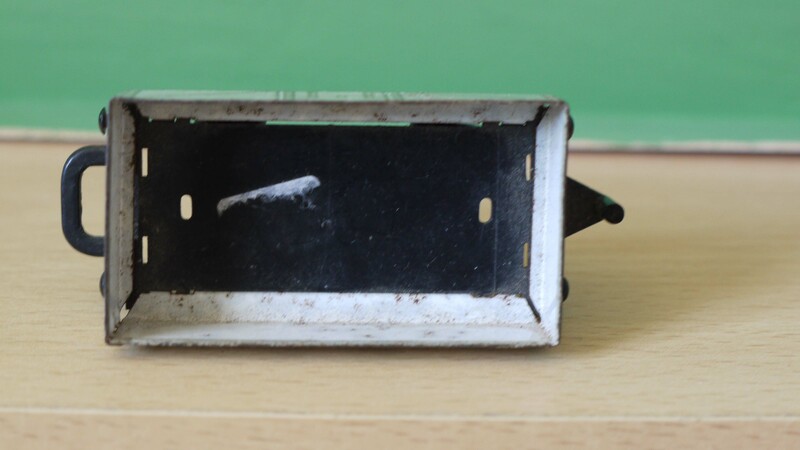 It's hard to find informations about Brimtoy. I only know the the goods train and the passenger train packages with the blue Class 37 diesel loco and the green streamline steam loco with passenger cars. Do you know a UK website with more informations about Brimtoy trains? But anyway thanks a lot! unfortunately I also can not shed any light on it. It is marked Great Britain. a closed wagon is not mentioned. 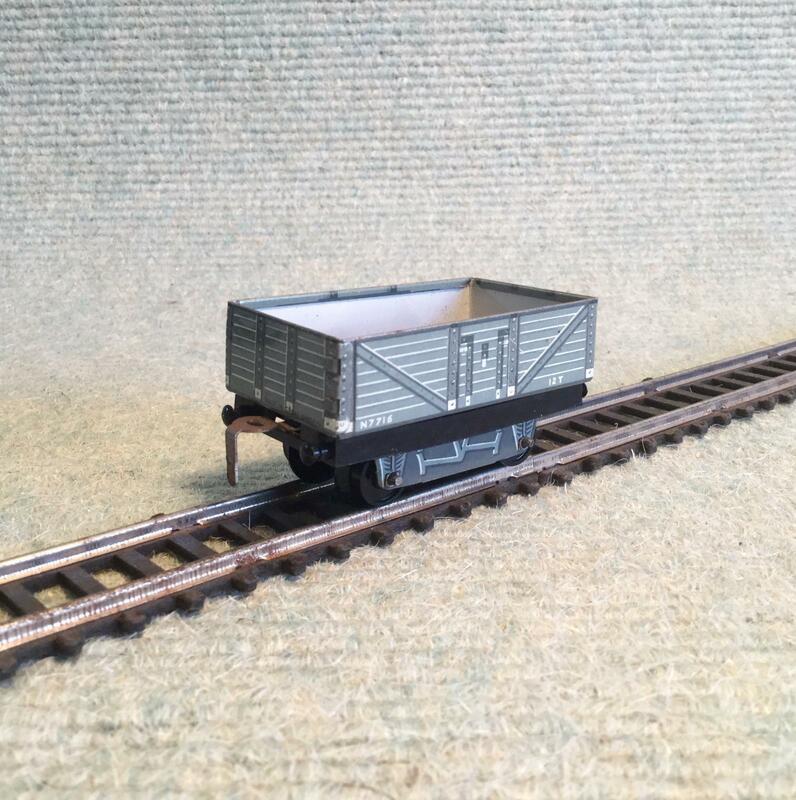 However I do not think these wagons are Brimtoy, the reason is the coupling. The hole in the loop is oval, the same as at Bernhards. I think this is quite specific. I do not know any company which made such a hole. All of them just punched a square slot into the metal. This is going to be an interesting topic. 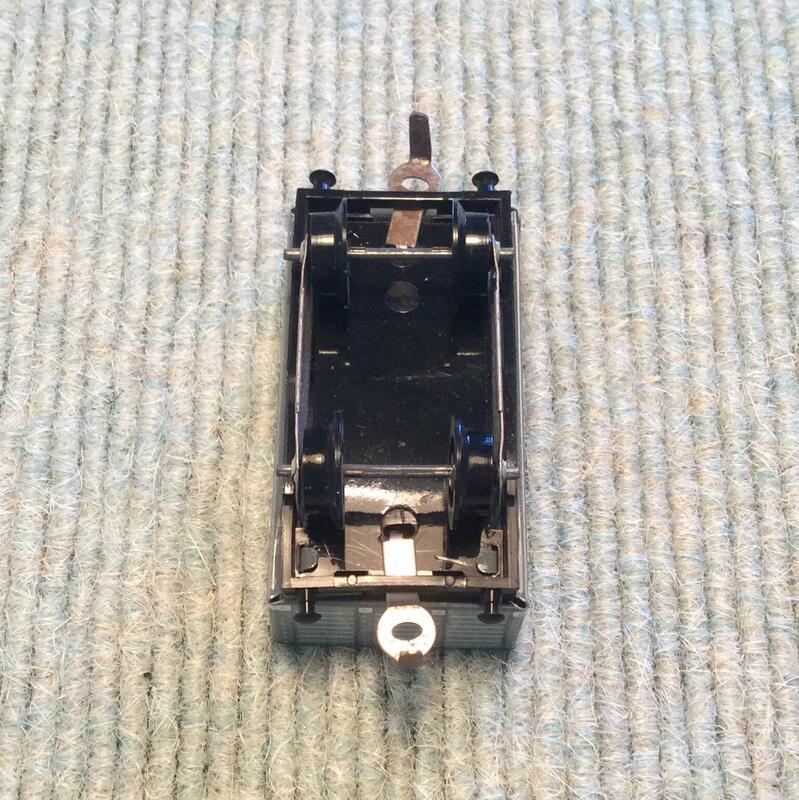 Rainer - maybe you're right with the idea it couldn't be Brimtoy - the coupling doesn't fit really with the hook on the Brimtoy diesel loco. But who is manufacturer then? 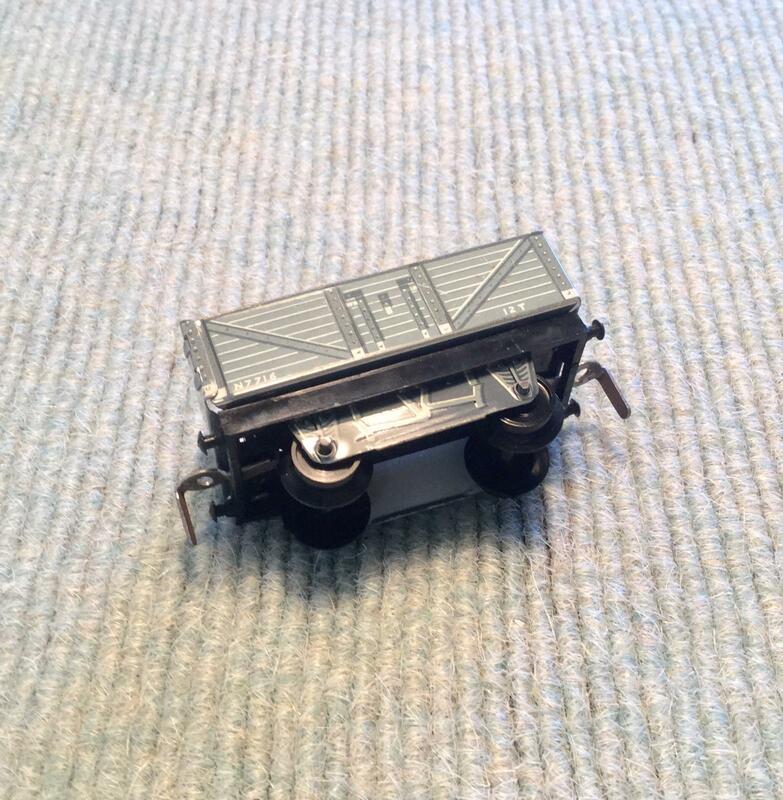 BTW: the streamlined steam loco exists in green color too (with clockwork). I missed this version in January on Ebay UK. ist es möglich die Brimtoy Katalog-Seiten hier oder auf Deiner Webseite zu zeigen? Die Züge bzw. Packungen habe ich schon gesehen -aber gedrucktes ist auch ganz schön. I think finally I can confirm that these trucks are Brimtoy. 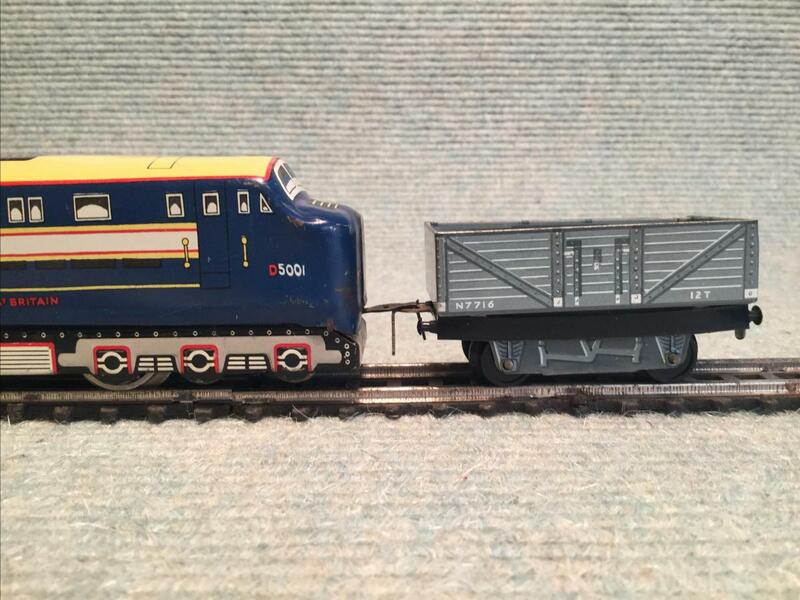 A while ago I managed to buy the green streamlined steam loco with two passenger coaches. Unfortunately the tender was missing, However this loco is pretty hard to find, so I decided to go for it despite the missing tender. Now only a couple of weeks later I was already very lucky to find the missing tender so I was able to complete the loco. 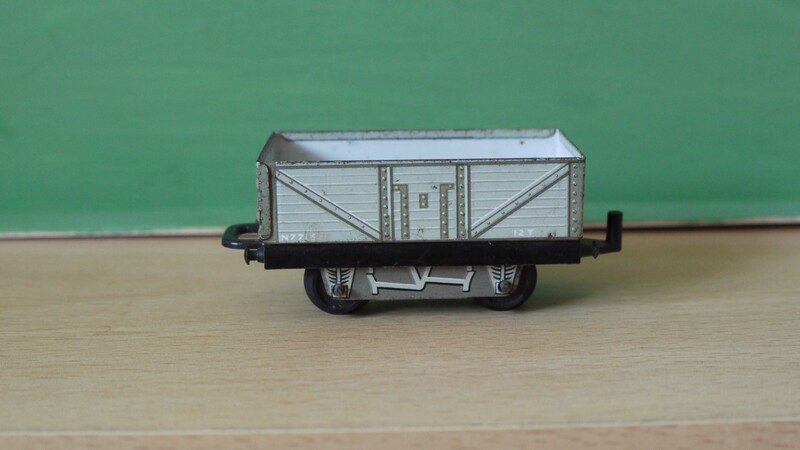 However the tender is what makes me think that the goods wagons are also from Brimtoy. These Brimtoy trains look very much like those of HWN, however there is one big difference. 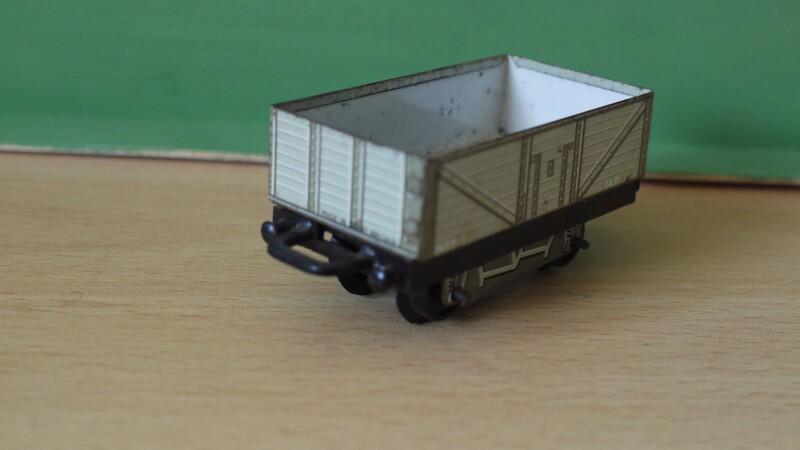 All Brimtoy wagons have plastic chassis while those of HWN are tin. 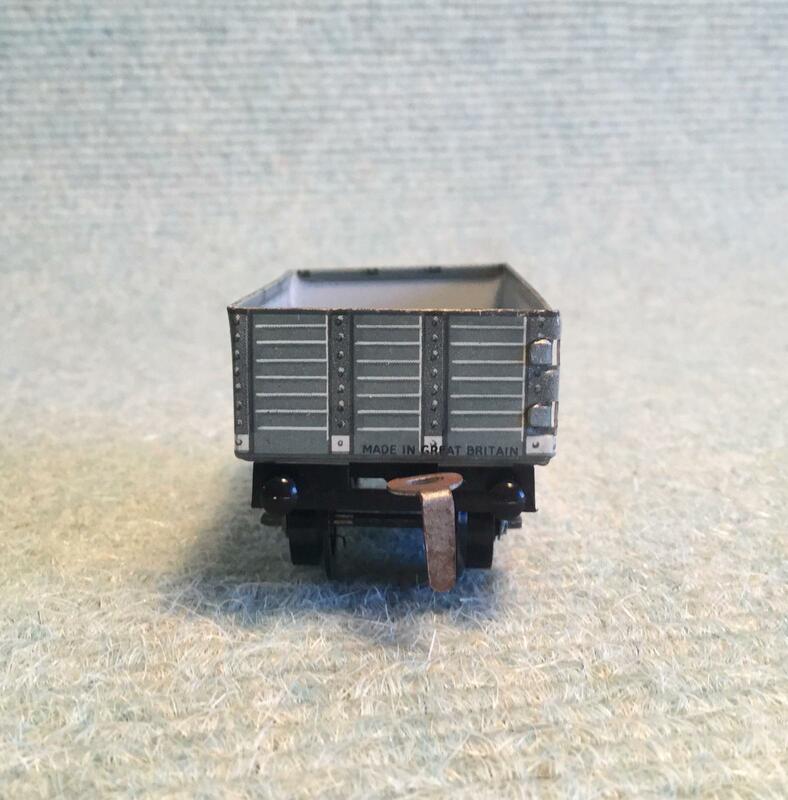 The axle bearings and side frames being one part with the wagons/tender body is quite a unique way of manufacturing. 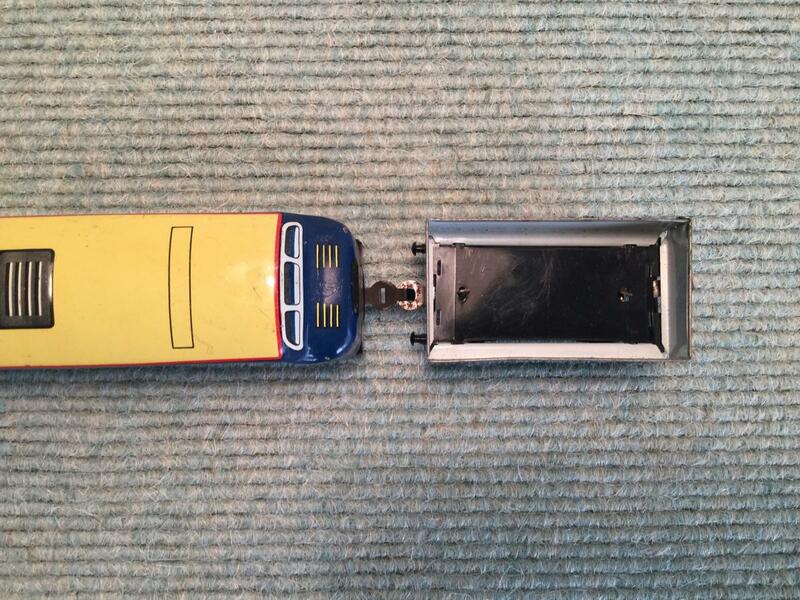 Also the buffers look identical. So I would think it is save to conclude that both are from the same manufacturer. cmnhorsebreeder und DustDBugger gefällt das. should we change the word [unbekannt] in the title of the first post to [Brimtoy] now ?